Apple Bans Game Featuring Pepe the Frog From App StoreWant to scream at Pepe? There isn’t an app for that. A Eulogy for Pepe the Frog, Who Died This WeekendThe amphibian, appropriated by the alt-right, is survived by his creator, Matt Furie. He was 12 in frog years. Zara Pulled a Skirt Featuring an Alt-Right Symbol From Its SiteApparently they’ve never heard of the alt-right in Spain? Pepe the Frog’s Creator Creates New Amphibian for MAD MagazineHe never intended the green dude to become a racist symbol, and he’s trying to subvert that. Cool Wendy’s Twitter Account Blows It by Tweeting Mascot for White SupremacyPepe the Frog is not a “a meme”; it’s an anti-Semitic hate symbol. The Alt-Right Just Turned on Bill Mitchell, the Trump Train’s Nate SilverPepe is apparently a bridge too far. How 4 Unlikely Cartoonists Blew Up During the Election SeasonThe Dilbert guy is rabidly pro-Trump. 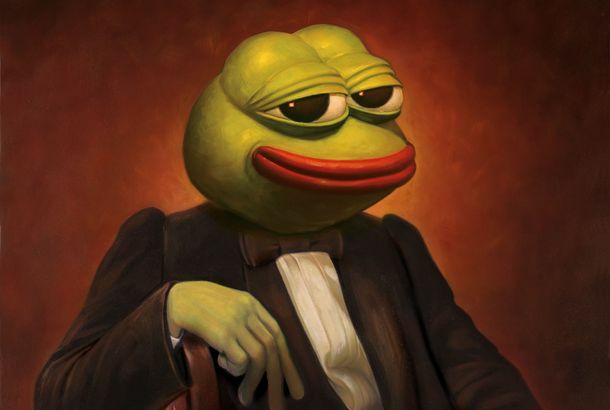 How the Anti-Defamation League Decided Pepe the Frog Was an Anti-Semitic SymbolThe infamous meme was classified as a hate symbol earlier this week. What Happens When Hillary Clinton Calls Your Cartoon Frog Racist“Politics are for dorks,” Pepe the Frog’s creator, Matt Furie, says.